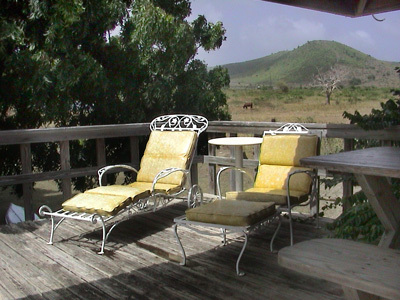 Estate Longford is situated on several acres on the south shore of St. Croix, surrounded by farm gardens and wild pastures. We have a small salt-water swimming pool, a lovely secluded beach, and numerous pasture trails to the shoreline for nature walks. By car we’re just a few minutes from additional South Shore beaches. The trees have grown up around the cottage quite a bit since this photo was taken! 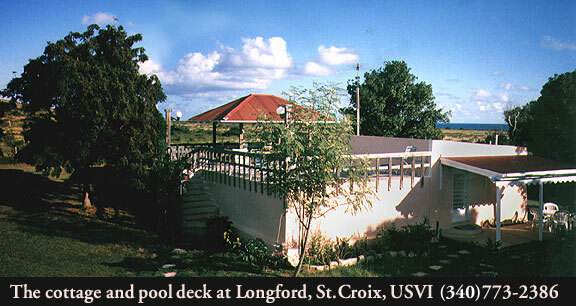 THE POOL AND POOL DECK, adjoining the Cottage, are exclusively for guest use while you are staying at Longford Hideaway. The pool is concrete but is elevated up a short flight of stairs, as it was formerly a cistern in use in the 1800s! 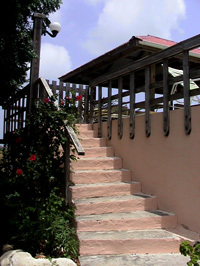 An outdoor shower was installed in 2015 for rinsing off sandy feet, salty water and beach gear, right at the bottom of the stairway. 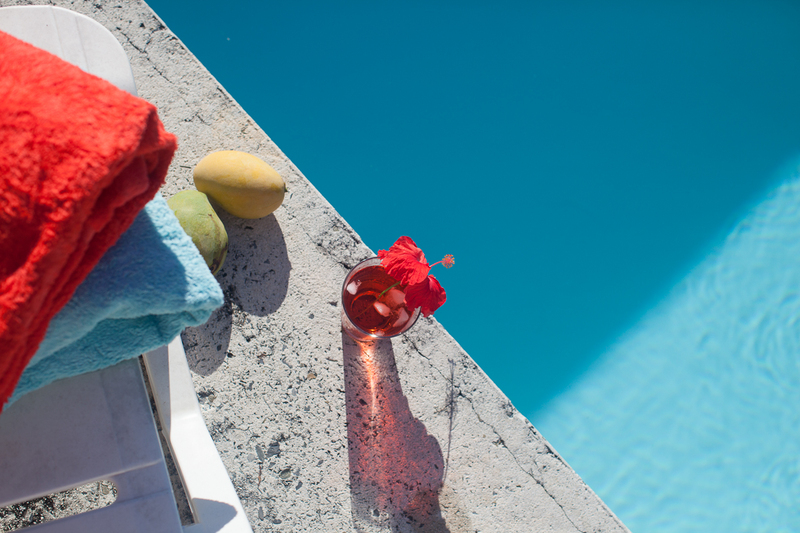 Our pool has a salt-water purification system, so the water is refreshingly soft and not chlorine-y smelling, with fewer harmful chemicals in the water. The pool is approximately 20 by 10 feet, six feet deep throughout, with both concrete steps and a ladder for access. The pool deck is partially shaded with lounge chairs and a large picnic table with WIFI access. 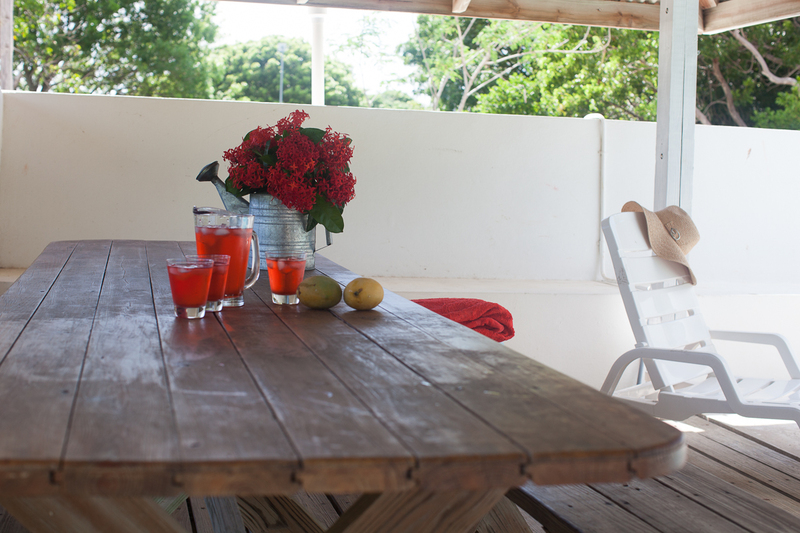 This makes it a great spot for relaxing and entertaining with beautiful views and a consistent breeze. 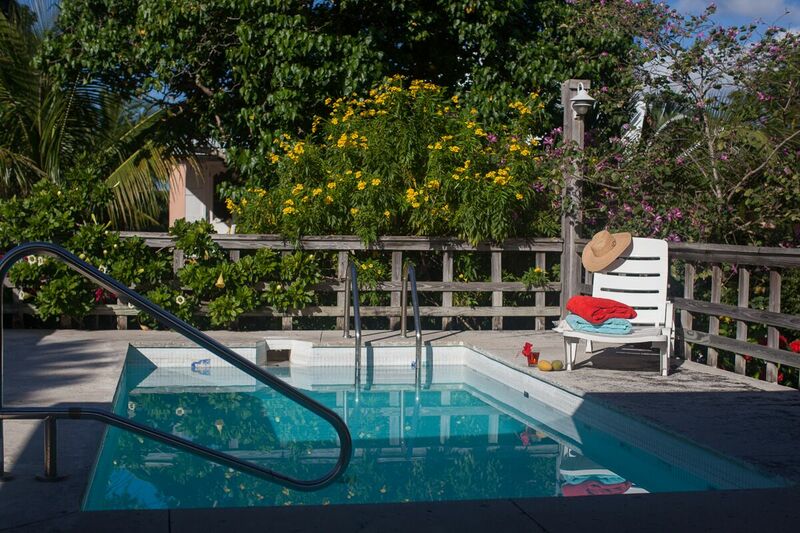 Many of our guests choose to spend their time relaxing, or even catching up on email, on the pool deck. From this vantage point they might see some farm activities: wild birds in the vegetable gardens, sheep grazing, or a morning cattle drive pass across the main road into the corral, just as in the 1700s when Estate Longford was built. A short flight of steps leads to the pool deck with beautiful views and breezes. The pool at Longford Hideaway. Perched atop an old Danish cistern and ringed by flowering trees, the pool deck is a great hideout for a lazy day or post-excursion relaxation. The pool is partially shaded for several hours a day. Relaxing poolside with some hibiscus tea. Longford Hideaway’s pool deck is the perfect place to catch up on your summer reading. This photo of the east view from the pool deck was taken prior to 2007. You can see cattle grazing where ARTfarm built toolsheds, gardens, greenhouses and the farmstand after 2009. We’ve fit more than 15 people around this giant picnic table up on the pool deck. It has hosted many family gatherings, wedding celebrations, potlucks, pool parties and even a business meeting or two. It’s a great shady breezy spot! THE BEACH at Longford, Manchineel Bay, is a leisurely ten minute walk (or 5 minute off-road drive) from the house through the pastures. It is safe, as public access by car is limited due to the agricultural operations. The beach at Longford is protected by a barrier reef so it tends to have calm waters and is great for snorkelling, beachcombing and relaxing. It’s also a favorite of local birdwatchers, and sport fishermen for flats fishing. Luca is available for permit and bonefish guiding. The South Shore Road is popular with cyclists and joggers and is a part of the annual St. Croix Ironman Triathlon route. With its unique combination of historical and natural assets, the 3,000 acres of primarily undeveloped pastoral area around us has been surveyed by the federal government and a proposal has been made to make it into part of the US National Park system. Many of the trees around the property have orchids growing on them. 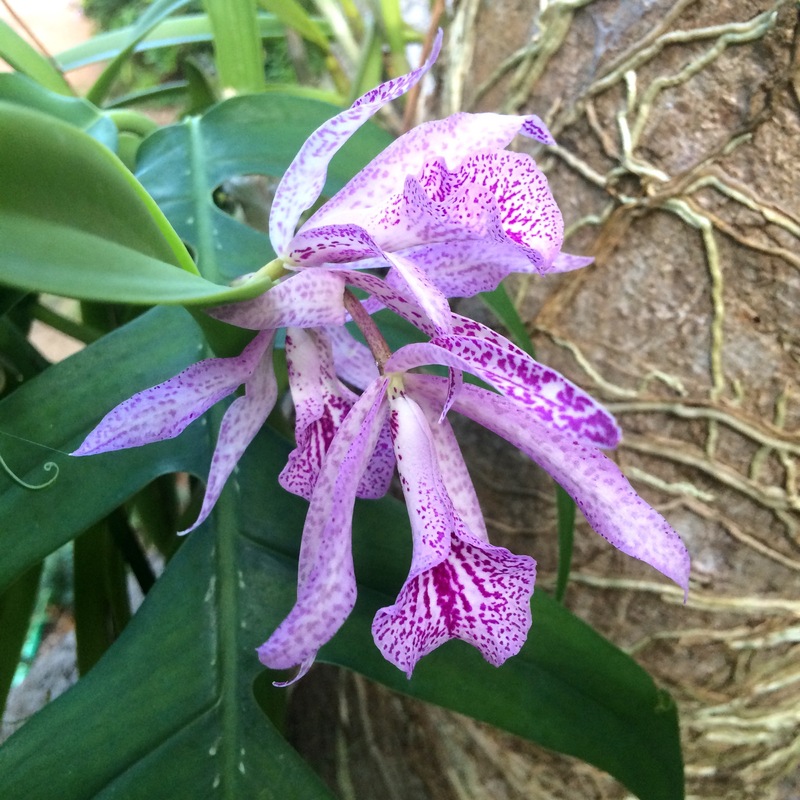 Valeria is a practiced cultivator of tree orchids! 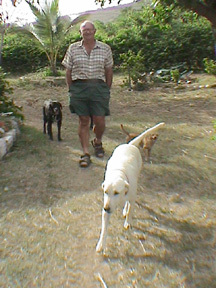 We enjoy taking walks around the house and pastures. There is always something new to contemplate growing in a garden bed or old coral brick wall, blooming on the side of the path or washed up on the sand. Let us give you a tour of our farming operations. We love to show our guests around the gardens, and give you first dibs on the harvest for the farmstands.